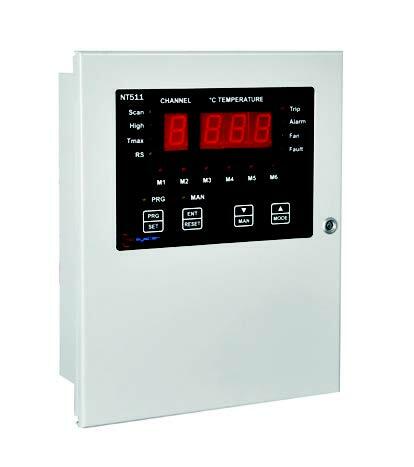 The NT511 Temperature and Fan control is a microprocessor based temperature controller that combines the temperature controller with the ability to power the fan cooling system directly. It has 4 inputs suitable for RTD Pt100 sensors which are all protected against electromagnetic interference. The basic outputs are 2 alarm relays (ALARM-TRIP) and 6 fan output relays which are all rated to 1.5A @ 230VAC. An alarm relay for sensor faults and pc board self diagnostic faults immediately alerts you of problems with the controller. Additional outputs are available like a digital RS485, or an analog 4-20mA output.